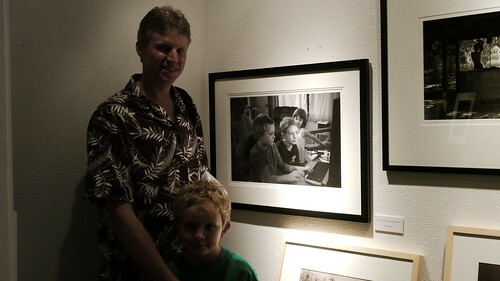 I promised that I would report on the opening of the Hawai`i Photo Expo 2010, which was Friday evening. It was well attended (rough estimate: maybe 150 people). The pizza and pupus went quickly. The fellow who hangs this show always does an amazing job. Weather was great and there was an interesting “embedded” show of handmade bells, some of which can be seen in the panorama above. The pano, BTW, is very distorted due to the fact that I took the constituent shots very quickly, and not thinking, had a zoom lens on set to very wide. The pano was taken close to the end of the opening, when most of the people had left already. I’m looking forward to going back and taking a more careful look at the show when I have a little more time. I’m on the board of the Hawai`i Photo Expo and it was good to see the show doing well with its first digital intake. It really made things so much smoother and less rushed all around. No prizes for me, but I’m just pleased to have a couple of pieces in the show. Eric, the show looks amazing. Congratulations for being a part of it! Thanks, Earl. The opening was rather short and lots of things going on, so I want to go back and take in the show with a little more contemplative study.